Osier Street Bridge is a minor waterways place minor waterways place place on the waterways major waterways place village town city on the Birmingham Canal Navigations (Icknield Port Road Wharf Loop) between Icknield Wharf (¾ furlongs to the west) and Sandy Turn (Eastern end of Icknield Port Road Wharf Loop) (2¼ furlongs to the northeast). The nearest place in the direction of Icknield Wharf is Rotton Park Feeder; ½ furlongs away. 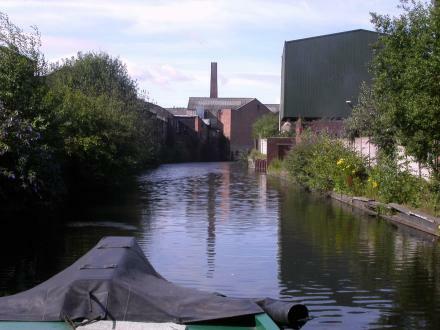 The nearest place in the direction of Sandy Turn is Rotton Park Corporation Wharf (Infilled); ¾ furlongs away. Rachel Osier Lindley is the Statewide Coordinating Editor for the Texas Station ... would pay for infrastructure, including flood control, bridges and streets. Division of Streets, Bridges & Harbor. Jeremy Mikolajczyk, Commissioner 1189 West Central Avenue Toledo, Ohio 43610. Phone: 419.936.2508. Fax: 419.245. Bridge Street Town Centre features Guest Services, a five-acre lake, carousel, train ride, walking trail and live weekend musical entertainment. Gazetteer for Osier Bed Lock No 15 a minor waterways place on the Grand Union Canal (Grand Junction Canal ... Park Street Bridge No 17, 2¾ furlongs. Find property to let in Osier Street, Wolverhampton WV1 with the UK's leading ... to amenities including Bentley Bridge Retail Park and New Cross Hospital. Broad Street, Birmingham, B1 2DS — 1554 yards to the east. King Edwards Rd, Birmingham, B1 2AA — 1216 yards to the east. Broad St, Birmingham, B1 2EA — 1559 yards to the east. Barclaycard Arena, King Edwards Road, Birmingham, B1 2AA — 1220 yards to the east. 100 Icknield Port Road, Birmingham, B16 0AA — 225 yards to the northwest. 46 Gas Street, Birmingham, B1 2JT — 1567 yards to the east. The Waters Edge, Broad St, Brindley Place, Birmingham, B1 2HJ — 1370 yards to the east. Broad Street, Birmingham, B1 2 — 1519 yards to the east. broad street, Birmingham, B151 — 1456 yards to the east. 182 Broad Street, Birmingham, B15 1DA — 1359 yards to the southeast. 36-37 Broad Street, Birmingham, B1 2DY — 1524 yards to the east. 55 Broad Street, Birmingham, B1 2HJ — 1455 yards to the east. Rosies Birmingham, 259-262 Broad Street, Birmingham, B1 2HF — 1494 yards to the east. 44 Broad St, Birmingham, B1 2HL — 1440 yards to the east. 184 Hagley Road, Birmingham, B16 9N — 1362 yards to the southwest. The Slug and Lettuce, Waters Edge, Brindley Place, Birmingham, B1 2HL — 1404 yards to the east. 4 Brindley Pl, Birmingham, B1 2JB — 1334 yards to the east. Langly Building, Regency Wharf, 266a 271 Broad Street, Birmingham, B1 2DS — 1544 yards to the east. King Edwards Road, Birmingham, B1 2AA — 1196 yards to the east. 229 Hagley Road, Birmingham, B16 9RP — 1169 yards to the southwest. The Water's Edge, Birmingham, B12 — 1426 yards to the east. Broad Street 5, Birmingham, B12 — 1586 yards to the east. 180 Hagley Road, Birmingham, B18 5DQ — 1321 yards to the southwest. Broad Street, Birmingham, B1 2EA — 1580 yards to the east. 9 Brindley Place, Broad Street, Birmingham, B1 2HJ — 1445 yards to the east. LEGOLAND Discovery Centre Birmingham, Birmingham, B1 2AA — 1158 yards to the east. Birmingham — 1607 yards to the east. 4 Sheepcote Street, Birmingham, B16 8AE — 992 yards to the east. 2 Brunswick Street, Birmingham, B1 2JF — 1375 yards to the east. Centenary Square, Birmingham — 1588 yards to the east. Centenary Square, Broad Street, Birmingham, B1 2EP — 1619 yards to the east. The Waters Edge, Birmingham, B1 2HL — 1290 yards to the east. 18 Highfield Road, Edgbaston, B15 3DU — 1542 yards to the south. 2 Bridge Street, Birmingham, B1 2JZ — 1627 yards to the east. 245 Broad Street, Birmingham, B12 — 1500 yards to the east. 1 Brunswick Square, Brindleyplace, Birmingham, B1 2HW — 1262 yards to the east. 158 Broad Street, Birmingham, B15 1DT — 1325 yards to the southeast. Birmingham — 1099 yards to the southeast. Birmingham, B18 5 — 1018 yards to the north. Birmingham — 1418 yards to the east. Broadway Plaza, Birmingham, BI6 8LP — 1049 yards to the southeast. Broadway Plaza, Birmingham, B16 8 — 1033 yards to the southeast. Broadway Plaza 220 Ladywood Middleway Birmingham, Birmingham, B16 8LP — 1061 yards to the southeast. 181 Broad Street, Birmingham, B15 1DA — 1351 yards to the southeast. 220 Ladywood Middleway, Birmingham, B16 8LP — 1107 yards to the southeast. 115 Reservoir Road, Birmingham, B16 9 — 465 yards to the west. 924 yards to the north.